T-Mobile’s Q4 2017 results won’t be announced until February, but today T-Mo decided to give us a taste of what its final three months of 2017 were like. T-Mobile added 1.85 million new customers in Q4 2017, making it the 19th straight quarter that T-Mo added more than 1 million customers. With those new subscribers, it also means that T-Mobile added more than 5 million customers in all of 2017, which is the fourth straight year that T-Mo has achieved that feat. Making up those 1.85 million new customers are 1 million postpaid adds (including 891,000 postpaid phone adds), 149,000 prepaid adds, and 633,000 wholesale adds. At the end of 2017, T-Mobile had nearly 72.59 million customers in total. Also of note is that branded postpaid churn finished at 1.18 percent in Q4 2017, down 10 basis points year-over-year. Branded prepaid churn finished at 4.00 percent, up 6 basis points YoY. T-Mobile also recently gave us an update on what its network looked like at the end of 2017. There’s 600MHz LTE coverage in 586 cities now, and you can check the full list right here to see if your town is covered. In total, T-Mobile’s 4G LTE covers 322 million people. I don’t know about you guys, but I never thought this kind of growth would be possible after the failed merger with AT&T in 2011. T-Mobile was in a pretty bad spot at that time, but they somehow managed to turn the ship all the way around. It’s pretty impressive that they’ve managed to more than double their base in basically 5 years. I’ve been with T-Mobile for 14+ years & I have no intention of leaving any time soon. Kudos! With great leadership comes great success! Before Legere, our CEO was there for one reason, get the AT&T merger. Once the DOJ nixed that, in came Legere full steam ahead and did a complete 180° resurrecting TMO. Truly awesome feat. It also helped that AT&T handed over $3 billion and $1 billion worth of spectrum when the deal fell through. Not taking away from Legere and the great marketing team, but the cash and spectrum infusion came just at the right time when Tmo was at a low point. TMO was at the “low point” because they wanted to sell…side from marketing, when the DOJ blocked the deal and AT&T paid the break up fee…Legere and company knew what to with with that on the engineering side, full steam ahead from there. You are missing that Tmo was grossly spectrum starved. Without the spectrum and money to build it up Tmo would still be dead in the water. 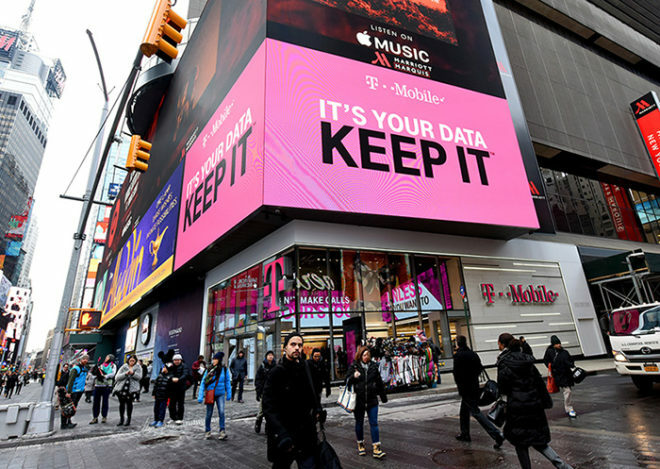 That was actually a fortuitous happenstance which gave just enough where Legere could actually adverise something – a legit service with at least some coverage in most places. . I understand exactly what you’re saying, I’m not missing anything. Yes we we’re starving for spectrum, we all knew/know that…the company wasn’t going to spend the money for spectrum back then cause they wanted to sell. BUT, they also knew if AT&T didn’t go through, they would need something to continue, they weren’t going to risk not having it go through without leaving with something in the pocket. Everything happened for a reason, and worked by design…we executed the plan, here we are. It isn’t just Legere. AT&T had to pay billions in compensation, both cash and spectrum, to T-Mobile with the Justice Department-rejected merger deal, and the spectrum that was part of that compensation deal has since quadrupled in value. T-Mobile put this into upgrading their network and hired Legere to market it, which he’s very good at. So, in the end, we have to thank federal regulators under the Obama Administration for insisting on four networks, as well as having to thank AT&T for being dumb enough to make a financial commitment before regulators had made a decision, as well as having to thank Deutsche Telekom’s decision to make something of their US subsidiary. How many of these are actually new customers or just customers adding fake 2nd lines just to get a deal on a new phone? I’m certain that with all the BOGO deals they’ve been offering it’s inflating these numbers quite a bit. If you’re already on the one plan It’s absolutely worth it. Many of the BOGO devices are over $800. People are just adding new lines and selling their 2nd phone on ebay just to cover the cost of their other phone. Cancelling a line 3 months later is minimal considering that price compared to an $800 phone. I’ve done it before, I know it’s worth it. But I (and probably a lot of others) am still on a plan lower than SC Unlimited so we can’t take advantage of the BOGO’s. My guess is “fake adds” are less than 100,000 of the new adds. Fake add still pays $25 a month for three months. No wonder, I can barely get 1mbps during peak hours these days. It’s frustrating, but my old simple choice plan is way too affordable.